Dan and I have been loyal to Bombay Bistro in Franklin for a while, but I think we have a new favorite in House of India. Located on Carothers near the Dunkin Donuts, House of India is owned by the same folks who used to have Bombay Palace in Nashville. It came highly recommended by a foodie coworker, so one night when I didn't want to cook, Dan and I met there after I was done with work. We went for a sit-down dinner (they do have a lunch buffet) and instantly felt welcomed. We were greeted with crunchy bread and assorted sauces and chutneys. We also had old-school table service with a cart/server that delivered everything from our dishes to our food. We ordered two breads, which were delightfully chewy! I like thicker naan, so this was perfect for our meal. We both ordered our Indian restaurant staples. Chicken tikka masala for me, and Malai kofta for Dan. We both felt that the food was excellent, the best we've had for Indian since we moved to Nashville. I was also excited to see that the portion sizes (and amount of meat) were very large compared to what you get elsewhere. And it's all kept warm via votive! The owner came by to greet us, and we gave him our warm appreciation for the great meal. He surprised us with some delicious rice pudding! 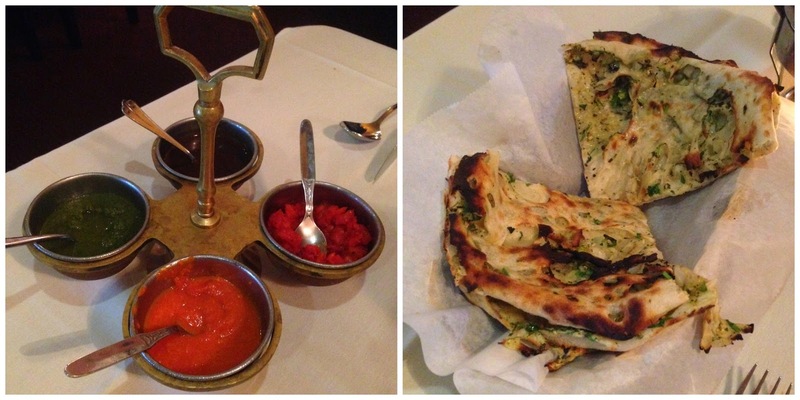 We will definitely be back to House of India in the future for more delicious Indian food. The service was really great! Chicken tikka masala is a safe bet, and their naan is so good. Oh goodness, that all looks so delish!